The 1964 Rolls-Royce Silver Cloud III featured here presents in complete factory specification largely wearing its original Shell Grey finish and Blue Connolly leather interior that it received over 50 years ago. This particular example arrived at the Liverpool port in January 1964 and was shipped to New York where it was delivered to its first owner, Luella Day Jeffery, on February 20, 1964. The accompanying build documents verify that the car was built to U.S. specification yet did not receive the Silver Cloud III script on the trunk lid due to the build card reading insignia on boot door not required. Jeffrey kept the Rolls-Royce in her possession until 1969, and the vehicle acquired less than 3,000 miles during this period. A New York couple possessed this Silver Cloud III for the next 45 years only adding 1,500 miles to the odometer under their ownership. In 2014 it was acquired by a Pebble Beach Concours winning Rolls-Royce specialist who recommissioned the motorcar with a full mechanical service in addition to a new set of wheels and tires. In 2017, this Silver Cloud III was shown publicly for the first time at the Rolls-Royce National Meet. This virtually unknown Silver Cloud III left a lasting impression on Rolls-Royce enthusiasts; judges were quick to bestow it with the Post-War Preservation Award (an honor that fits this incredibly original example). The original Dunlop Nylon whitewall tires are still mounted to the original steel wheels and are included with the car. However, another set of tires and wheels reside on the car for safety purposes. Additionally, this Silver Cloud III is accompanied by its original owners manual, tools, jack, build document copies and the original factory supplied quart of lacquer touch up paint that to this day has never been opened! In March 2019 it received a meticulous cosmetic refreshing and is now ready for future preservation class concours events. This is the most original and lowest mileage Silver Cloud III we have ever had the pleasure of offering. Ready to make an investment that you can actually enjoy? Classic cars have proven to be among the most resilient and rewarding investments in recent years with the Historic Automobile Group Index (HAGI) jumping 39% in 2013, 16% in 2014 and 17% in 2015 while posting gains of 467% over the last 10 years. Please contact one of our expert sales consultants at (314)291-7000 or info@schmitt.com for more information. They will be happy to give you a complete walk-around, supply you with a more detailed description and answer any questions you may have. Buy with confidence. Considered the pinnacle of the Silver Cloud series, the Silver Cloud III was unveiled in Paris during fall 1962. The most prominent changes were the inclusion of a four headlamp layout. Additionally, the radiator grill was shortened and the bonnet was given a slightly increased slope. An improved interior contributed to the 220lb loss of weight over the Silver Cloud II. The Crewe engineers were able to increase the power to weight ratio by 7% due to an increase in both the compression ratio and the size of the carburetors. The Silver Cloud III was the last Rolls-Royce model produced using body-on-frame construction, and the last example was finished by hand at the Crewe factory in 1966. Only 2,044 Silver Cloud IIIs were built during the short three year production run, which was the lowest of all the Silver Cloud Series. The quality and craftsmanship of the Silver Cloud helps to elevate it from every other car ever built and showed the world how good Rolls-Royce was at producing an artistic masterpiece. 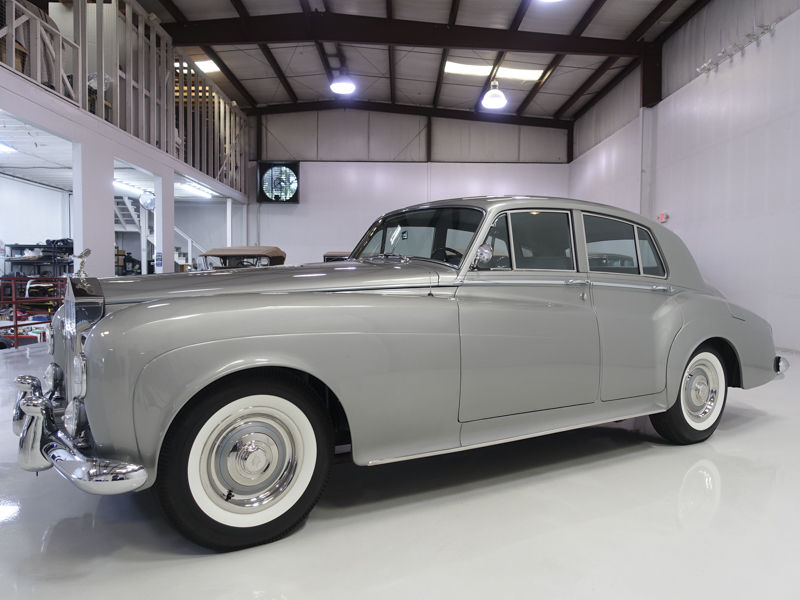 This 1964 Rolls-Royce Silver Cloud III was listed for sale on 4-14-19 08:33:15. The vehicle color is Shelly Grey and VIN is not available	. Kindly check ad for seller's location. Seller`s stock ID is danie407140_SlvrCld. There are 76 other Rolls-Royce cars currently listed for sale on our website. You may desire to see what other Rolls-Royce cars are selling for by visiting our Sales Data page.